An Air Force Munitions Systems Specialist (MOS 2W0X1) performs and manages munitions production and material tasks and activities; identifies munitions and equipment requirements; operates and maintains automated data processing equipment (ADPE) to perform munitions accounting, computations, and research; stores, maintains, assembles, issues, and delivers assembled nonnuclear munitions. This specialist tests, assembles, and processes nonnuclear munitions. They prepare munitions for loading on aircraft and check safe and arm mechanisms. 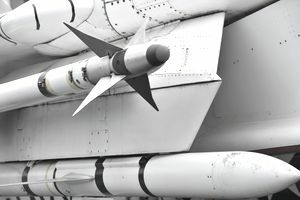 They install warheads, guidance units, fuses, arming wires, explosive bolts, squibs, strakes, wings, fins, control surfaces, and tracking flares. They also prepare, assemble and test aircraft rockets and loads in launchers; process aircraft gun ammunition; maintain and recondition munitions and MMHE; recondition, repair, and replace defective or missing parts. They also work to maintain shop or bench stock material and secure replenishment and modify munitions and all MMHE when directed. They'll also inspect munitions for serviceability and apply munitions product assurance procedures; install spotting charges in bombs; process ammunition; and inspect ammunition, components, and containers for defects. Preparing documentation and indicating identification and quantity of assets is also among their tasks. They also perform routine demilitarization of nonexplosive munitions items and repackage munitions and applies container markings. Receives, stores, handles, and transports nonnuclear munitions. Checks shipping documents for accuracy. Delivers munitions to assembly, storage, or maintenance areas. Prepares munitions for shipment. Determines and maintains storage facilities, reports, safety, and security requirements. Performs inspections and maintains inspection and storage records. Performs operator maintenance on munitions vehicles and equipment. Performs munitions materiel management and material accounting functions. Performs and oversees management and procedural application of manual and automated inventory control and accounting functions. Conducts inventories and corrects discrepancies. Accomplishes requisitioning actions and maintains due-in, due-out, and status files. Maintains source document control and ensures validity and completeness. Recommends system and program changes to data processing methods. Develops and maintains stock level data. Monitors excess munitions programs. Prepares reports. Operates and maintains ADPE for munitions accounting, reporting, and status configuration. Coordinates with maintenance activities on repairable munitions components. Obtains material for equipment modifications, periodic component exchange, and maintenance. Receives, stores, handles and transports nuclear weapons. Establishes and evaluates performance standards, maintenance controls, and work procedures. Computes data to support financial planning and programming. Analyzes and validates munitions host-tenant and interservice munitions support agreements and plans. Develops methods and techniques to maintain and recondition munitions and handling equipment. Evaluates munitions account condition, identifies deficiencies, and initiates corrective actions. Ensures compliance with policies, directives, and procedures. Evaluates munitions equipment maintenance. Evaluates procedures for assembling, renovating, and storing munitions; and procedures for demilitarization of nonexplosive munitions. Provides status information and expected completion dates. Analyzes mission effectiveness, program requirements, and stock control levels, and validates requirements. Analyzes stockpile requirements to determine type and quantity of munitions facilities needed to safely store, inspect, maintain, and secure munitions assets. Knowledge: The specialist must have knowledge of composition and characteristics of munitions, storage, safety, and security and environmental requirements and procedures; fusing and arming systems; technical drawings; precision measuring tools and equipment; wiring diagrams; handling, use, and disposition for nonhazardous materials; munitions materiel accounting systems; basic mathematics; policies and procedures for accountability and pecuniary liability; techniques of munitions materiel management and procurement; Air Force property accounting; munitions policies and procedures; inventory and stock control; preparing and maintaining munitions records and documents; procedures for hazardous and nonhazardous materials; and procedures for assets turn in. Education: For entry into this specialty, completion of high school or General Education Development equivalency is mandatory. 2W031. Completion of a basic munitions systems course. 2W071. Completion of the Air Force Combat Ammunition Planning and Production course (PDS code 8RM) and the in-residence 7-level craftsman course. Experience: The following experience is mandatory for award of the AFSC indicated: (Note: See Explanation of Air Force Specialty Codes). 2W051. Qualification in and possession of AFSC 2W031. Also, experience is mandatory in performing functions such as warehousing, accounting, mechanical assembly, electronics, construction, transportation of munitions, use of hand tools, and preparing and maintaining documentation and records for inventory management actions involving manual or automated systems or both. 2W071. Qualification in and possession of AFSC 2W051. Also, experience is mandatory in supervising or performing functions such as receipting, identifying, inspecting, storing, reconditioning, issuing, delivering, maintaining, testing, and assembling guided and unguided munitions; or preparing and maintaining documentation and records for inventory management actions. 2W091. Qualification in and possession of AFSC 2W071. Also, experience is mandatory in managing functions such as accountable munitions material operations; munitions storage, maintenance, and assembly functions; munitions inspection; equipment maintenance; line delivery and handling functions; computing levels; automated data processing; or maintaining munitions material management accounts. For entry into the specialty, normal color vision as defined in ​AFI 48-123, Medical Examination & Standards. Normal depth perception as defined in AFI 48-123. Qualification to operate government vehicles according to AFI 24-301, Vehicle Operations. Secret security clearance, according to AFI 31-501, Personnel Security Program Management. Required Appitude Score: M-55 or G-55 (Changed to M-60 or G-57, effective 1 Jul 04).